December was a busy month for Hospital appointments. The Allergy Consultant I saw in August (previous blog post) had referred me to a Dietitian and Dermatologist. I don’t have much to say about my dietitian appointment. I was assured that I have been managing my free from diet well and I clearly know my way around the Free From aisle. The only advice was to up my calcium intake and challenge my OAS. As I have never seen a Dermatologist for my eczema the consultant thought it was worth a referral for further skin tests. Dermatologists are able to test substances like metals, perfumes, plants and household chemicals. Testing involves three appointments in the same week as reactions can take a longer time to develop. As the photograph shows during my first appointment, substances were applied to my back in special small containers held within a tape. On the second visit the patches were removed, the tests were marked out and any reactions noted. On the third visit, the Dermatologist takes a final reading and discusses any results. 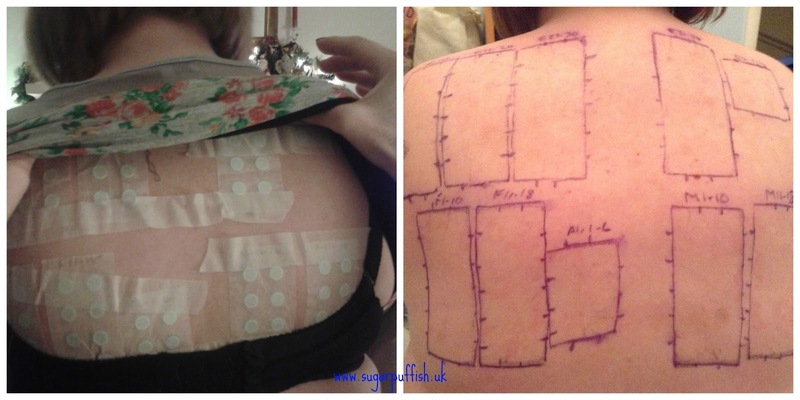 The outcome of my patch testing was a mild reaction to Hydroperoxides of Linalool and MIT (Methylisothiazolinone), however, I was warned about false positive due to my eczema. MIT is a preservative I have always avoided but perhaps my love of lavender will have to end given the linalool result. For as long as I can remember my eczema has always been referred to as Atopic. The dermatologist confirmed this but also believes I have Seborrhoeic Dermatitis and Urticaria. Seborrhoeic (pronounced seb-or-A-ik) simply means a rash appears in areas of the skin with large numbers of grease (sebaceous) glands, such as the scalp, face and centre of chest. According to the literature provided to me, Seborrhoeic is not fully understood, but yeast called Malassezia that lives on skin plays a part in causing it (FYI this is not the same yeast present in foods or that causes thrush). Urticaria is also known as hives or nettle rash. It is caused by the release of histamines from cells in the skin called mast cells and can be triggered in many ways. From my research, it looks like this may explain my reactions to penicillin, some foods and grass. Where do I go from here? It certainly has been an interesting set of appointments. I have confirmed in my own mind that I was not wrong about my extremely sensitive skin and my decision to avoid certain ingredients is worth continuing. I have been informed taking anti-histamines on a regular basis (normally I only take during hayfever season) may help with the Urticaria. The Seborrhoeic dermatitis is the tough one as it appears treatments manage the condition but do not cure it. At this stage I have declined prescription creams and steroids. Antifungal treatments are the recommendation but I will be seeking a natural alternative. Some people may think I am bonkers to turn down treatment but I quit prescription eczema medications 16 years ago after noticing damage to my skin so I am extremely reluctant to use them again. I return to my Allergy Consultant in February and I will be blogging my progress following the Dermatologist's diagnosis. I am now googling like mad and if any readers have experience of these conditions and can offer advice then please do leave a comment below. I have been going through an eczema saga since last March. Affects my face, neck, arms, and hands. I did a patch test as well and removed the hand creams and nail polishes that had ingredients I was sensitive to (lanolin, formaldehyde resin), but the rash came back in a different form. I've been alternative between a dermatologist and naturopath. My naturopath put me on a high dosages of probiotics (100 billion) and fish oil (3000 mg omega-3s), and suggested I try a gluten-free diet if I did not want to yet pursue a food sensitivity test. I went off the gluten-free for Thanksgiving time after being on it for 2 months and got a nasty red rash on my face and neck a few days later... I get my food sensitivity test results back end of this week. Got to my dermatologist yesterday after waiting a couple weeks for an open appt and traveling for work in mid-December. He gave me a Prednisone Rx, I have given in to it since I've had this rash for so long... I was seeing some progress recently in my face skin texture (was very dry, crocodile-skin style so felt like I was a dandruff queen having to gently scrub at my face with a towel 2x a day and simplify my skincare routine to oil-cleansing every couple of days and only using moisturizers- no serums or toners) after adding turmeric pills and evening primrose oil to my supplement routine as well. I had read a couple blogs and articles that suggested EPO both as a supplement and topical oil. Thank goodness for the internet, treasure trove of info! I will make sure follow your blog better this year. Best wishes to you in your journey this year! Sounds like you have also been having a difficult time. I have another blog post in the pipeline on my thoughts about exclusion diets and the research I have done online, I will say I am anti-gluten free diets. I would recommend pursuing any tests for food allergies based on my own experiences of childhood atopic eczema and eliminating certain foods (under medical guidance), there is a correlation between the 2 in my case.